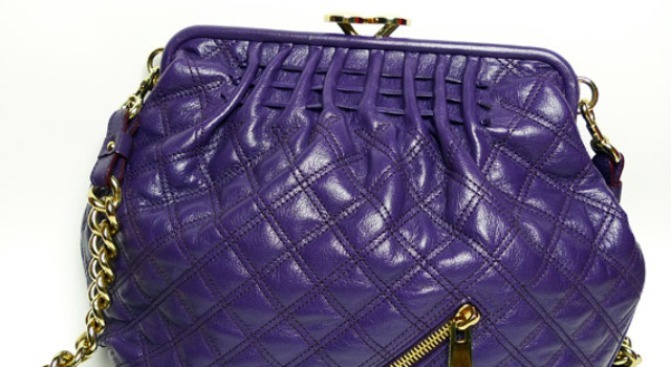 Buy this Marc Jacobs bag for almost half price! Remember when model and muse Erin Wasson sold her clothes at a massive garage sale at her boyfriend's store to benefit an animal charity? Or when Gwyneth Paltrow put her clothes up for auction on eBay to benefit the Robin Hood Foundation? Well, add to the list devoted style blogger Wendy Lam, also known as the gal behind one of our favorite fashion blogs, nitro:licious. The wares in the just-launched nitro:licious shop are a little bit hit-or-miss (we're a little underwhelmed by the Topshop Union Jack tee, and oddly, a "Married to the Mob" lipstick tee was one of the first things to sell), but there are a couple of really choice finds up for grabs. Lam's offering up a gorgeous purple Marc Jacobs "Bonnie" bag -- that's only been worn once -- for almost half the price (was $1295, now $700), and we're weirdly enamored with these rainbow Adidas high-tops (just $30! Peep the buckles!). We also like this striped Cacharel sweater -- it would look so chic paired with white jeans for cool summer nights, or dark stovepipes and a blazer come Fall. One note, however: While previous fashionable females may have been selling their clothes in the interest of charity, Ms. Lam's interests are purely capitalist in nature. (We imagine she's pocketing the cash.) But hey, it's a recession, remember?